Channel 12 News poll finds that Israel Resilience Party wins 21 seats, while Labor wins just six. Likud remains largest party with 31. 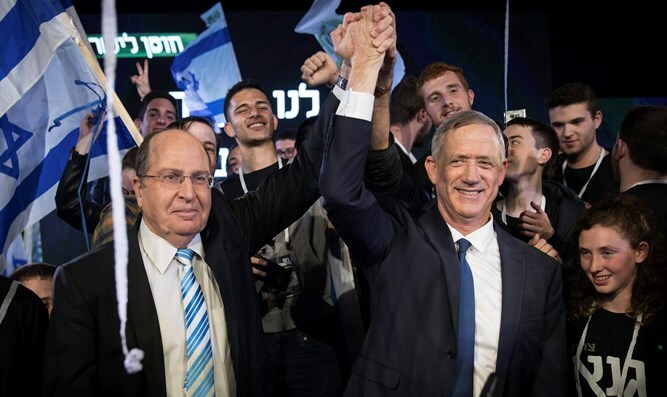 A poll published Wednesday evening on Channel 12 News finds that Benny Gantz's new party, Israel Resilience, is gaining momentum at the expense of Yair Lapid and the Labor Party. If the elections were held today, the poll found, the Likud would win 30 seats, the Israel Resilience Party would win 21 seats, Lapid's Yesh Atid would have 11, Naftali Bennett and Ayelet Shaked's New Right would win seven Knesset seats, as would the haredi United Torah Judaism. The Labor Party, headed by Avi Gabbay, would win just six seats, the Joint List would have six seats as well, as would Ahmed Tibi’s Ta’al faction. Moshe Kahlon's Kulanu receives five seats, Shas has six seats, while Meretz, the Jewish Home, Yisrael Beytenu and Orly Levy-Abekasis’ Gesher party receive only four Knesset seats each. Otzma Yehudit, Moshe Feiglin’s Zehut and Tzipi Livni’s Hatnua party fail to pass the electoral threshold. The poll was conducted by Dr. Mina Tzemach and Mano Geva with the iPanel Institute among 505 respondents in a representative sample of the total population in Israel aged 18 and over. A poll published earlier on Wednesday on the Walla news website found that Gantz's party would win 19 Knesset seats, making it the second largest party in Israel after the Likud, which receives 29 seats in the poll. The polls are the first since Gantz’s first public speech on Tuesday evening which kicked off his election campaign. In his speech, Gantz declared his intention to run for prime minister and promised, "On April 9 I will establish a government, a government of power, a government of responsibility and firmness, a responsible government that is concerned about security and not intensifying anxieties."